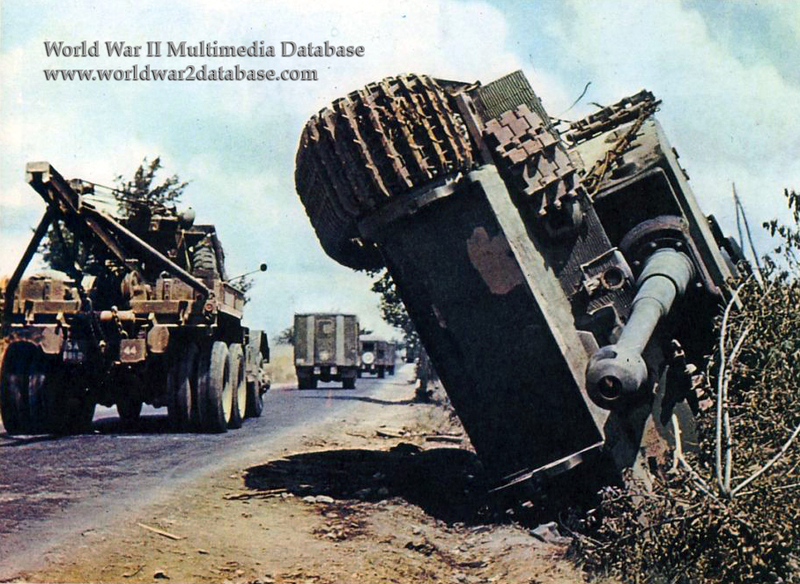 Panzerkampfwagen VI Ausf E Tiger I of Schwere Panzer Abteilung (Heavy Tank Battalion) 508 is overturned next to Highway 6 near Poggibonsi, 20 miles (32.1 kilometers) south of Florence. Schwere Panzer Abteilung 508 was sent to Italy to counter the Allied landing at Anzio in January 1944. Equipped with Tiger Is and Panzer IIIs, the Battalion fought a withdrawal through Rome, attached to various German infantry units. After Rome fell on June 4, the Germans began a general withdrawal north, and Panzer Abeteilung 508 was used to prevent the Germany Army in Italy from being cut off. Facing constant air raids and little time for required maintenance, thirteen of 508's Tigers, including this one, were destroyed and abandoned by their crews because of mechanical failures by June 13. When the Battalion reached Poggibonsi, the day this photo was taken, it was equipped with new Tigers, bringing its combat strength to thirty-seven. The Battalion fought in Italy with the Tiger I tank throughout the war. In early 1945 it received Panthers as well. The lack of tanks and spare parts forced some of the Battalion to be employed as infantry in March-April 1945 as the unit was withdrawn into Germany.